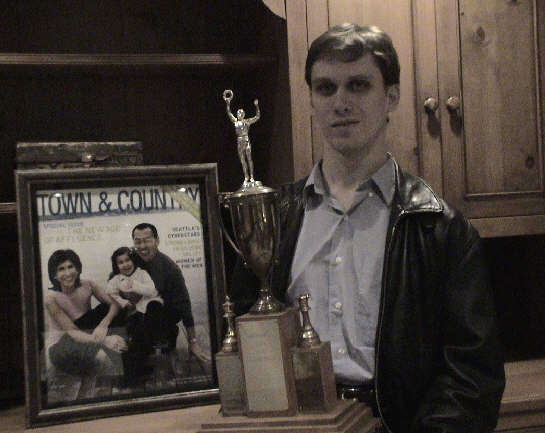 Harley Greninger won the Washington Challenger's Cup in tie-breaker quick chess. Greninger, David Bragg and Paul Bartron tied for first place in the open section with scores of 3.5 out of 5. Robert Allen won the reserve section with an excellent score of 4.5 out of 5. John Julian won the Spokane Xmas Chaos event on December 11 with 3.5 points, earning $33. Dave Griffin took the U/1600 prize with 3.0, earning $17. Jim Waugh had the best U/1300 with 2.0 for $13. BC Wins 14th Annual Intermat Competition 28-20, defeating the Washington team. Washington Class Championships (Nov 26-28) and Thanksgiving Scholastic Tournament (Nov 26) – Bellevue, Washington. See a report with winners listed by class. From USCF: 554 Chess Kids Enjoyed Chess and Chocolate at the 2004 National Youth Action Chess Championship, Nov 11-14, 2004, Hershey, PA. Full story here. Results of the Turkey Quads completed in Spokane: Quad A: Phil Weyland and Adam Attwood split $50; Quad B: Chris Copeland swept and received $50; Mini-Swiss C: Jim Burney earned $50 with a perfect 3.0, Ron Weyland and Jim Waugh split $25 for 2nd place. The 82nd Puget Sound Open was held at the University Place Library on Oct 23-24. The winners were: 1st Mike MacGregor $102.50, 1st Group #1 Bruce Gregg $61.50, Group #2 Stephen Buck & Dan Gay $28.70 each, Group #3 Alex Ostrow $53.30, Economy Group Jason Fetters (certificate). First Upset: Bill Rogers (1370) drew Ernst Rasmussen (1803). Tacoma Chess Club Championship was held on Friday nights in Oct. The winners were: Club Champion for 2004 Paul Bartron (plaque & Chess Vision 8000 computer), Club Jr. Champion Jesse Mahaney (trophy), Class A Marvin Hayami (trophy), Class B Ernst Rasmussen (trophy), Class C David Wight (trophy) and Class D Jerry Olson (trophy). Spokane G/10 quick event (Oct 30) – Mark Havrilla took 1st overall winning $100. Other prizes: Class A: Kirk Steinocher $25, Class B: John Julian $25, U/1600: Kevin Korsmo $25. Kevin also had the biggest upset for another $15. Chris Copeland and Pat Herbers were declared co-champions in the recently completed 2004 Spokane Fall Championship. Each scored 4 out of 5. Nick Raptis won the 2004 Eastern Washington Open with a 4.5 score after drawing David Sprenkle in round 4. Sprenkle (also drawing with Paul Bartron in round 5) tied for second with Drew Serres and Hannigan Pitre. Oregon Open – Sep 4-6 in Eugene, OR. Congratulations to winner Oleg Zaikov with a great score of 5.5 out of 6 games. Blake Phillips finished second with 5.0. Victoria Labour Day Open – The winner was Dan Scoones with 5 out of 6 points. Congratulations to Tacoma Chess Club Summer Championship winner Paul Bartron. 2004 U.S. Class Chess Championships Draw 173 Chess Players (USCF story). 2004 US Open Pictures (USCF story). Congratulations to Spokane Chess Club tournament winners: Great Auntie's Open: Pat Herbers, August Ajeeb: first quad – Kirk Steinocher, second quad – Steve Brendemihl and Adam Attwood (tied), bottom group (mini-Swiss) – Jim Waugh, with a perfect score! Qualchan Quads: first quad – John Julian, second quad – Mark Anderson and Phil Weyland (tied), bottom group (mini-Swiss) – Adam Attwood with a perfect score! Spokane City Championship: FM Dave Sprenkle became the new Spokane City Champion when he managed to outlast three-time defending city champion Curt Collyer in a G/25 tiebreak. Washington State Senior Adult Championship (age 50 or older) was held Sat-Sun August 7-8 in University Place, WA. Congratulations to winner Paul Bartron! Chess Odyssey Summer Olympics was held Saturday, August 7, 2004. See the results. Seattle Seafair Open – held Jul 30-Aug 1 or Jul 31-Aug 1 (at player's option) at the Seattle Chess Club. This is their major tournament of the year. Carol Kleist reports "We had a successful Seafair Tournament with 55 players. A 3 way tie for 1st: Bragg, Koons, Collyer." ChessHeads Tournament – This variant of chess, which uses a card deck to define certain actions that can be performed on the board, held its First Official Pre-Release ChessHeads Tournament on July 31, 2004. Arthur Dake Memorial IM Tournament – Held June 5-13. Washington Open – Held Memorial Day weekend (May 29-31). GM Gregory Serper won the 2004 WA Open with a 5-1 tally. The reserve section was won by Portland's Peter Prichett also scoring 5-1. The Booster section was taken by Igor Ummel finishing at 5.5. Oregon State Championship (May 1-2, 7-9) – Congratulations to champion Oleg Zaikov! Elementary Tournament Results – See the results and rating report for the 2004 Washington State Elementary Championship, held on April 24 in Bellevue, WA. April 24-25 Results! – There were four tournaments scheduled the weekend of April 24-25. They were located in Grants Pass, Portland, Richland, and Tacoma. See partial or full results for three of these four events. Shankland finishes high in National Elementary Championships – Adam Shankland of Washington scored 5.5 of 7 in this event, finishing in 12th place. The winner, after consideration of tie breaks, was Marc Tyler Arnold of New York, who scored 6 of 7. See photo and a list of other Washington State teams and individuals who did well. 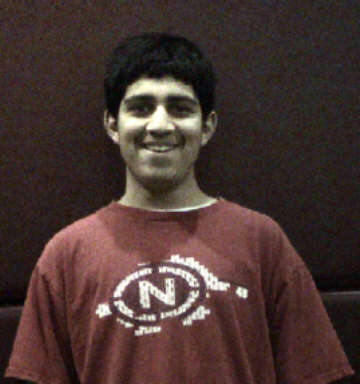 Lanka wins Washington Junior Open and Reserve – Adi Lanka, shown here, was the winner of this big annual event, held March 27. Click on the link for complete results and more photos. Washington Elementary Team Championship results. Chess Odyssey students do well in Oregon Chess for Success state finals. See the story. See an article about the event in The Oregonian. Washington High School State Team Championship standings. Spokane Winter Championship – Congratulations to Mark Campbell. Dave Collyer Memorial – IM John Donaldson and local Expert Curt Collyer tied for first in this 62 player event with scores of 4.5. See the linked page for the results. Washington State Championship/Premier – Concluded February 16 in Bellevue, WA. See linked page for the results. Congratulations to Slava Mikhailuk on repeating as Washington State chess champion. Washington Challengers' Cup – The Washington Challengers' Cup tournament was held January 3-4 at the Seattle Chess Club. Results appear in the February issue of Northwest Chess. 2004 Chess Odyssey Winter Olympics Team Tournament Results.